While reviewing this blog, it occurred to me that for a new person reading this site and interested in an iMac G4 mod, as there have been several different mods, it would be difficult to decide which one is best. I've decided to summarize the different mods I've done with a brief review of benefits and problems. All these mods really focus on one thing - being able to use the decade old iMac G4 chassis with modern hardware. The hardest technical problem to solve is to be able to use the screen at the top of the neck with conventional hardware. Other additions include touchscreens, bluray players etc. Over the past few years myself and others have tried many different solutions to this problem. I'll discuss my various solutions here. As I feel they've gotten better and more stable, I will try to go chronologically. The MODS are linked to their original blog posts. Click for more details. Summary: By drilling holes in a VESA 75/100 adapter for the iMac G4 neck, an entire new monitor can be firmly secured to the iMac G4's neck. Additional features: I put an internal bluray into the base with an SATA to USB 2.0 converter. So this mod functions as an ergonomic external monitor and external usb bluray drive. Status: Still in use, although I replaced the 17" pictured here with a 20" monitor. 4) As long as you choose lightweight monitors, any size or screen ratio can be used. With new ultrathin, lightweight LED monitors, potentially >20" size screens can be used. 3) Weight of LCD can be an issue. 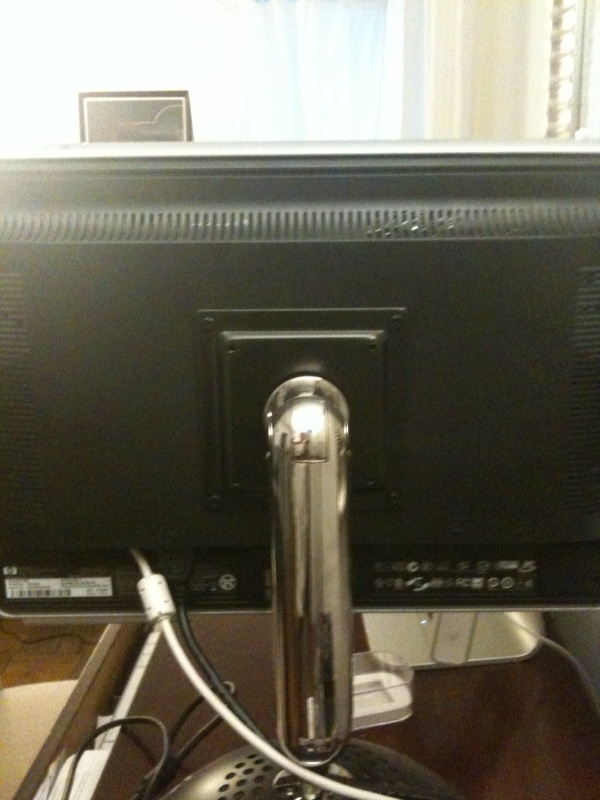 For 20" neck (any size monitor) lcds should be around 10 pounds. But also can not have too much of a shelf in the back or the monitor is displaced to far forward and the monitor will not be able to tilt. Additional features: Bluray as above. A surface acoustic wave touchscreen with controller also attached to the back of the monitor. 1) Breakable - The monitor components are very sensitive and are easily damaged. Summary: Replace the native iMac G4s LCD with a 16:10 store bought monitors LCD. Place the components including LCD controller and inverter in the base. Replace the iMacs TMDS wiring with more conventional LVDS wiring. I did both 20" and 17" versions. Status: 20" disassembled secondary the safety concerns. 17" disassembled for parts to use on other mods. - Once the current passes through the inverter it becomes very high voltage. As a result high voltage cables travel through the neck. The 20" has SIX CCFL lamps so 12 wires (6 high voltage) are carried through the metal neck. I was not able to fit all extra shielded wires due to the tight fit in the neck. After using this for a little while - I became too worried that one of the wires could fray and arc to the metal neck. For the 17" I was able to fit rubberized, shielded wire for its 2 CCFL inverter wires. I would ultimately like to not run ANY high voltage cable, but at least the 17" can be loaded with extra protection. 3) Components are housed in the base, taking room away from anything else intended to go within the base. 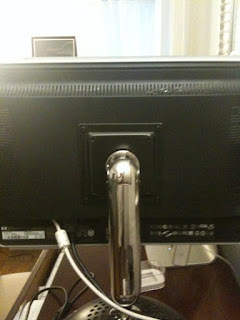 5) Monitor Drift - although the touch screen fits, it does cause the neck to slide down in certain positions. 6) Apple used a TMDS chip in this computer for a reason. It is theoretically more stable than LVDS over longer distances. Although the image seems crisp and clear to me either way. 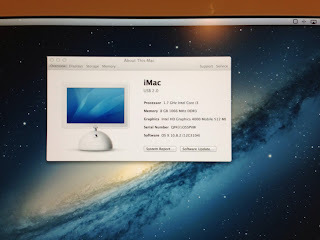 Summary: Using the native iMac G4 monitor, inverter, and TMDS wiring, but adding a power source and converting the TMDS to a standard DVI connector. 15" version demonstrated by several moders before me. 17" connections and pinout detailed on my blog. 2) Full Step by Step guide available for 17"
1) There is some color variation - so make sure that you are using the pinout for the right version of the neck. 2) Only 15 and 17" versions. Update: No longer true, now available in 20" see below for details. 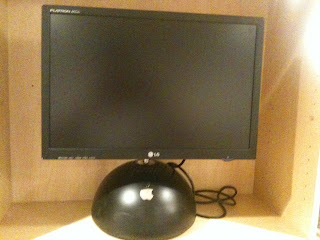 Summary: Use a 20" Apple cinema display and all its components to replace the native iMac G4's monitor housing. Cut a hole in the back and cover the original "wire out" hole. Using the native wires in the 20" neck plus the power cable from the Apple Cinema Display - all wires go through the neck into the base (including the rear USB ports) - to a DVI and USB cable which can be hooked up to any computer, in this case a Mac Mini. The front bezel of the iMac is then added to the cinema display. Additional Features: A 20" 5-wire resistive touchscreen, wired through the neck and to a USB hub where one USB cable goes to the external computer for both the USB ports on the back of the monitor and the touchscreen. 5) Looks almost identical to the native iMac G4 and aluminum on the back actually matches most of apple's modern products. 6) Power brick can be hidden in the base. 3) Have to open the neck - while the original cables can be used for touchscreen, USB, and DVI, no native cables can replace the DC power to LCD controller. 4) Requires an external computer. 5) Although similar it is not identical to the native iMac G4. Summary: Use a native 20" iMac G4 including native LCD, monitor case, dome, and inverter with the LCD controller from an Apple Cinema Display to power it hidden at the bottom of the base. Incorporate an ECX form factor Core 2 duo motherboard in the base to make this a true all-in-one computer. Additional Features: All-In-One computer and Blu-ray drive is able to fit in the base. Status: Base components removed in favor of Mod #6A. 1) A true All-In-One computer with Intel x86 Processor. 2) Small Form Factor PC allows a full size drive, in this case Blu-ray to fit inside. 3) Visually identical to native iMac G4. Utilizes original power button and with some extenders, new ports can be made in place of the original ones. 4) No monitor drift and all wires go through the neck. 5) Easier than most mods - no "construction" required. 1) Expensive - Although you do not need a full Apple Cinema Display finding a working LCD controller board and cables may cost as much as an intact monitor. Although not as expensive as a mac mini, ECX boards are overpriced based on specs alone, and the RAM and processor are purchased separately. 2) Uses compact flash hard drive. Although you can use a hard drive like any other mobo, to save space I used the onboard compact flash slot. This is not nearly as fast as other sold state options and is very expensive per GB. 3) Not a Great Hackintosh - as you can see it currently uses windows. 2 problems with hackintoshing this - for one, snow leopard will not recognize compact flash. This can be solved by squeezing in a small SSD (such as a 1.8". However, while the hackintosh community has gotten the onboard Intel 4500HD graphics to display at its native resolution (complicated hacks) there is not yet any QE/CI support. 4) Power bricks are external. Although small, there are 2 - the apple cinema display's and a 60 watt brick for the mobo. 5) Extensive Neck Modification - this entire mod is about the neck. Uses some wires from apple cinema display, some from native neck, and I used an additional wire from a different iMac neck. Summary: Variation of Mod #6. This uses an unaltered iMac G4 20" enclosure (same exact mod as above). 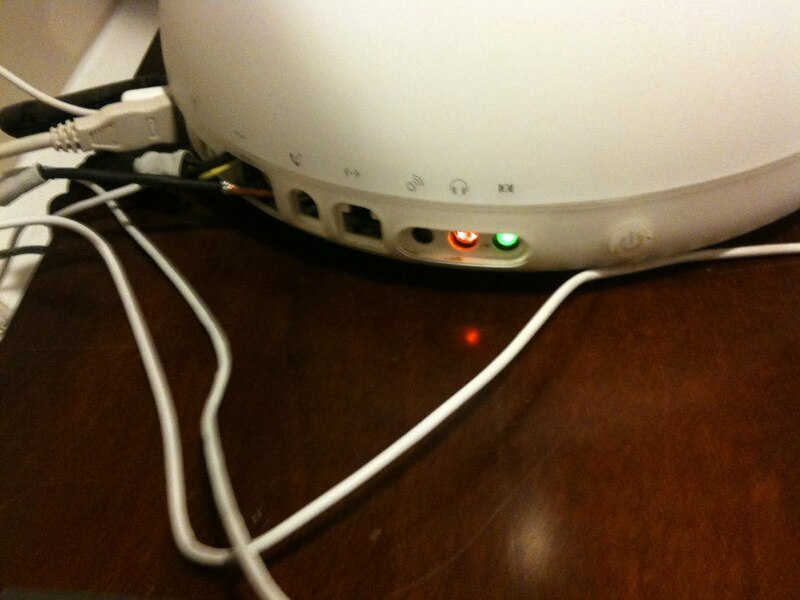 However, the all-in-one has been removed and replaced by the power brick which has now been internalized. As above this mod relies on the 20" aluminum Apple Cinema Display's controller board hooked up to the native iMac G4 inverter. As I have now learned, this TMDS board works perfectly with the native 20" 16:10 LCDs from either the aluminum Apple Cinema Display, the iMac G4, or even the iMac G5! Two ports on the back are a DVI out and a computer power cable. It is hooked up to a mac mini in my setup. Additional Features: Can include DVD/Bluray. Can make use of Cinema Displays powered USB and Firewire 400 ports on back of base. Status: In Use as part of dual monitor display with a converted iMac G5. 1) Visually and functionally identical to original iMac G4 and ACD's powerbrick hidden in base. 2) External computer allows for easy upgrades and versatility. Can use as external monitor for laptop. 3) Room in Base - as only the power brick and lcd controller board are in the base, there is room for additional components: DVD/Bluray, wireless docking base station for laptops etc. 4) No monitor drift and all wires go through neck. 6) Despite its authenticity its actually one of the easier of the mods to do if you can get the parts. 1) Still Expensive: requires cosmetically good housing from iMac G4, A working ACD controller and cable, a working LCD, and of course - a computer. 4) Extensive Neck Modification - as before this entire mod is about the neck. Uses some wires from apple cinema display, some from native neck, and I used an additional wire from a different iMac neck. 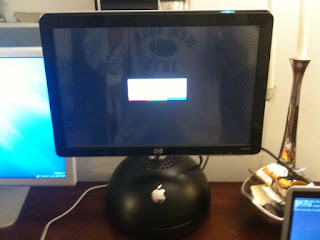 MOD #7: The 20" iMac G5 as an External Monitor Mod. 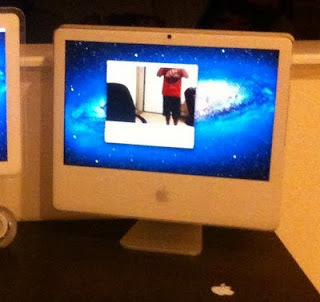 Original iMac G5 and the iSight iMac G5. Summary: I know this site has been primarily dedicated to the iMac G4, however the iMac G5 is actually quite similar. Also, its a great design in its own right. Since the LCDs of the cinema display and iMac G5 are (depending on model) either identical or slightly varied. 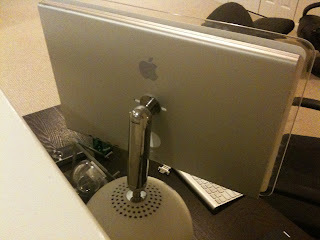 As a result you can re-purpose a cinema display with a broken LCD or damaged aluminum case. In the original mod there is plenty of room to work with. The entire metal chassis which holds the inverter and lcd controller can fit inside the g5's chassis. The cinema display's cable can then be routed out the back in place of the iMac G5's original power cable. The iSight variation is similar except the LCD controller and inverter much be placed individually in place of the previous computer components. In addition the iSight camera can be spliced with USB as well as the microphone. Connecting these with the cinema displays on board USB ports and this monitor becomes an external webcam with mic as well. Additional Features: Lots of room in original - can easily fit slim slot load dvd and speakers. Much tighter in iSight, but can use iSight/mic via USB. Status: Original iMac G5 is use as a spare monitor. The iSight variation in daily use as dual monitor with iMac G4 in Mac Mini Setup. SUMMARY: Although this is a variation of the TMDS to DVI presented in MOD#4, the 20" is more complex. This took me over a year to figure out and is truly the computer I had hoped to build when I first started. Although more advanced variations may come including LED backlights, touch screens etc. I do not believe it is possible to make a much more authentic version than this. So I want to give it its own space. This mod uses an unaltered 20" iMac G4 frame, monitor components, and neck. The entire mod takes pace within the dome. Using a Pico Power Supply and a 12V to 24V DC Step Up converter, power is provided to the LCD and backlights. Using the same DVI connector seen in MOD#4 the TMDS signal is properly aligned to be DVI compatible. A Hackintoshable Sandy Bridge ECX board, the KEEX-6100, serves as the computer. This fits within the space previously occupied by the 3.5" Hard drive. A DVD optical drive also fits within the base, allowing this to have all the functionality of the original. Additional Features: If its in the original iMac G4, its here. The DVD optical drive. Even the Power LED and Microphone in the LCD enclosure work. Status: Updated to MOD #9. 2) Relatively Easy from a Technical Standpoint - The LCD and Neck do not need to opened or even removed. Only the dome and the cables that come into the dome are modified. The DVI Connector makes this much easier, though this is more difficult than the 15" or 17" version. 3) Cost - while the KEEX board, the SSD, the Pico Power Supply, and a cosmetically good 20" iMac G4 with working LCD can be expensive, this is not much more than you would expect to pay if you were putting together any other Sandy Bridge Set up using off the shelf components. A good case, a SSD, a sandy bridge motherboard and processor, a power supply, and an LCD monitor will run about the same. No other "large" purchases are required. The DVI Connector is available for a few dollars and the Step Up Converter is about $20. 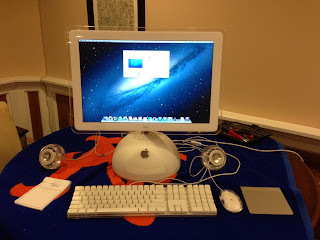 5) A 20" iMac G4 with a Sandy Bridge Processor that is Running Mac OS X Lion!!! 1) There is an external power brick. Apple had the luxury of being able to design a circular power source. The rectangular commercially available AC to DC converters just don't fit in the dome. For heat reasons this can actually be a good thing. As this is a 40 pound desktop that is going to be in a fixed location, this really isn't such a big deal. 2) Onboard Audio causes a Kernal Panic. The onboard audio is pretty crappy, so I have not looked to see if there is a fix for this and simply disabled it. 3) The original speakers still require an amp such as the PowerWave adapter. 4) This is a Hackintosh not a true Mac. SUMMARY: Based on the same TMDS to DVI conversion used in the previous mod. The smaller Intel NUC form factor allowed for an upgrade to Ivy Bridge and HD4000 graphics. The small board and my better understanding of the native PSU allows the use of the native PSU which offers more power and eliminates the need for an external powerbrick. This all results in improved cooling, graphics, and stability. The mod is based on the consumer targeted Intel NUC which is fully compatible with Mountain Lion 10.8 via tonymac's Unibeast. With the internalization of the power brick, only close inspection of the ports identifies this as anything other than an original 20" iMac G4. Additional Features: Everything Above: The DVD optical drive. Even the Power LED (not hooked up, but connector in base - personal preference) and Microphone in the LCD enclosure work. Thunderbolt is also untapped potential. 1) Virtually Identical to the original iMac G4. Even provides a firewire power port for use with the native Apple Pro Speakers. 3) Cost - Much more reasonably priced than the above mod. Although not cheap, the NUC board includes the processor, needing only RAM, Wifi, and a mSATA to use the NUC. The use of the native PSU is potentially a huge savings. No other "large" purchases are required. The DVI Connector is available for a few dollars and the the converters Converter are usually less than $20. 4) The NUC is Hackintoshable to Lion with tonymac's Unibeast. 5) Stability - this may not be the best system imagineable, but it is quite stable. Unlike PICO PSUs, the existing PSU, easily powers this board, LCD, and peripherals, with plenty of room to spare. The 2 fans remain quiet but greatly improve cooling to the point of an afterthought. 5) A 20" iMac G4 with an Ivy Bridge Processor that is Running Mac OS X Mountain Lion!!! I hope this summary helps anyone attempting this, but not sure which way to go. Please feel free to ask any questions. First of all let me just say congratulations on the success of all of your mods, your arsenal of iMac G4's really makes you the de facto source for information on this subject. I am still very envious of your 17" TMDS to DVI mod and slowly but surely making progress on my own version of it. I sent a few questions to your email address a few weeks back but they seem to have gone unreplied. It's possible that they got eaten by the junk folder but in any case I will resend them now for you to have a look and possibly answer some questions for me. To give you a heads up on my project, I am at the stage of trying to fit my mini-tix into the base of a gutted 15" inch g4. I am doing this for sizing and when I am satisfied I will hopefully be able to recreate it on the 17", so in terms of the base, this is really just a practice run. The biggest obstacle right now is the tmds to dvi mod, I want to clear up all the misunderstandings I have before I go about ripping into the tmds and inverter cables. Heads up for the email, and thanks again for your help. Thanks for posting this. We had several G4 imacs at work which were great machines because they were essentially portable desktop workstations. 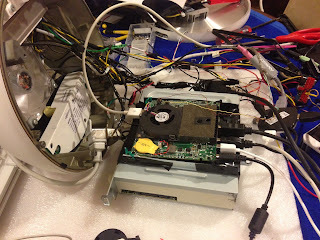 I have an older one I intended to "mod" into a modern PC by retro-fitting a new monitor and itx parts. I wasn't sure it could be done, but this has definitely given me ideas. has been especially useful. But as with a lot of these types of projects, people loose interest and you never saw the end result or if they were successful or not. So I wanted a place where those interested could get a sense for the complexity, positives and negatives of some of the various ways to approach this mod. Ive been reading through all of the mods that you've successfully done and Ive gotta say that I'm very very impressed. Almost gives me the courage to do it with my own 15" G4. Id actually like to use it as an external display, I assume that the tmds to dvi conversion must be carried out? How does it differ from the 17/20 inch conversion? You had said earlier in your article that previous modders had previously demonstrated the mod on a 15 inch G4 as well, but I've been searching far and wide on google and rummaging through forums but have been unable to find any info. If you could point me in the right direction I'd be grateful. Mixxy, thank you for the compliment. Its the same as the 17" but the wires themselves, inverter, and pinouts are different. I'd be happy to show you where the info is. On page 9 of a macrumors discussion (link below) - look for posts from pgee70 - this will give you the pinout. Good luck and let me know if I can help you any further. I do want to congratulate you for your excellent job modding iMac g4. I want to do a mod myself and since I already have a 20" screen and a 17" neck and base I wonder if the 17" base and neck will stand a 20" screen. I know that 15" neck and base won't stand a 20" screen, but what about 17"? If needed I will add extra weight in the base in order to balance the weight of the 20" screen. Thank you so much for your help and sorry for my bad English. Greetings from Mexico! I found a 20" neck on eBay, it costs $35 dollars plus $22 of shipping cost to Mexico. I don't know if this is a reasonably price because I cannot found another like this here in my country. What do you think? And I also can't found a 20" base and I think that that faraday cage you showed me is kind of expensive to me. So, I wonder if I can use the 17" base without the faraday cage but adding some extra weight somehow. What do you recommend me to do? Is the 17" base the same size as the 20"? Thanks and sorry for making too much questions, I guess that's because I'm so exited doing this mod. That price sounds reasonable. The size is the same, but the faraday cage of the 20" weighs a few pounds more. You should be able to add additional weight to the base to get the same effect. Just remember that space in the base is very limited, so if your goal is just to have an external monitor, you should not have any problem using the 17" base and filling it with "dead weight". But, if your goal is to have a functional DVD drive or computer in the base, then really every square inch is important. And you don't have to apologize about asking questions, its my pleasure to help. Without other modders help, none of my mods would have been possible. Hi Jon, I'm very happy because I just bought a 20" neck with its cables. Now my next doubt is about the 17" base. As I understand, 17" and 20" bases are the same size, right? The only difference in these bases is the faraday cage that I assume is heavier in the 20" model. Am I right? But since I haven't found a 20" base on sale, I'll use the 17" model with its lighter faraday cage and add the extra weight with something. I wonder if there's something I can remove from the LCD cage (maybe the internal metal in the back) in order to have a lighter screen. They are the same size. I wouldn't remove too much weight from the LCD (even if it were possible) as you may affect the neck function. Man I've been looking how to keep my 17" Mac G4 relevant. Thanks for all your work. How can I use a mac mini with the 17" G4 as an external display? Do you have a step by step instructions set? I'm a noob at this. Damien - there really isn't much to it, to be honest. What you have to do first is identify which 17" iMac you have (the 800mhz or the 1/1.25ghz) - the necks are different. You will need a soldering iron, solder, a set of torx screwdrivers, a multimeter, electrical tape, 3 - 1Kohm resistors, a safety pin, a DVI connector or DVI cable to splice, and a power source (a picoPSU or an AC to molex adapter) is probably the best choice. Connecting into the motherboard via a small black connector is the video cable (you will recognize it easily as a grey wire and black wire join together to form it. 2 other wires come through the neck and go into a much larger black connector. One of these wires is the inverter cable (it is labeled as such). Free the pins of the inverter and the video cable with a safety pin to spare in the pins on the end. Using the chart I provided in my blog, connect and solder the pins from he video cable to the appropriate DVI pin/wire, or power source. I know it sounds complicated - but I promise its really not too bad. I have an iMac G4 1Ghz with a 17 inch screen. I want to use the screen as an external monitor. How do I do it?? A step by step would REALLY help, as I'm no expert at modding. Pictures are good too. Whatever you can do to help, I am thoroughly grateful. Hey Alex - I have gotten several requests for a step by step. I will do my best to post it in the coming weeks. But remember all you really have to do is take the wires and solder them by color as shown in the pinout. I do realize that it may be confusing to someone without prior knowledge and will do my best to post an easy to follow tutorial. I'm really excited because yesterday arrived my 20" neck that I ordered from US. Now I think I have all the components. A 20" LCD screen with its original boards, a 17" base case, and now I have the 20" neck. I'm planning to use the whole native LCD screen including the native inverter. In order to provide 24V for the native inverter, I could use a 12V to 24V tension converter or maybe I could buy a chinese brick for PowerMac G4 wich provides 24V and then use a picoPSU wich supports 24V. But I wonder how many watts does the LCD screen need? Because the bricks for PowerMacs could only provide like 85 to 90w I supose. The other solution I was thinking is to put an ATX Power supply without fan and chasis just inside the dome. I know this is crazy, but a complete power source will provide me of a bunch of watts that I need to power both the LCD (with its inverter) and the mini-ITX mobo (with a core i5), plus I could use the 12V to 24V tension converter. Or, maybe i could use two bricks: one for the picoPSU, and the other, wich is going to be a PowerMac brick, will be to power just 24V for the monitor. And since the PowerMac bricks aren't too big (same size as MBP), I could put one inside the dome and connect it to an AC power source with a long cable. There are many posibilities, but I'll try first the powersource ATX inside the dome because I think it's cheaper. Let's see if I success. I'm sorry, I said PowerMac all the time, but it actually is PowerBook brick. There are some great mods here! I am using my (wife's) old imac g4 as a music player in my kitchen, which works great. However the space is not perfect where it fits. What I want to do is remove the monitor from the body and then extend the wires and attach the monitor to a wall/cupboard/something (it will be pretty close to the base unit). I can see from other places it is easy to take the monitor off if you are happy to leave the metal arm attached to the body. I'm fine with this as the base is not particularly visible. My problem is how easy would it be to extend the wires? What wires would I need to buy? Would just be a bit of soldering and protecting? Hey David, unfortunately what you are planning is not such an easy task. While doable, soldering the microscopically thin TMDS wires that run through the neck is very tough. In one of my mods I became so frustrated that I replaced the wires altogether rather then solder them. You would have to cut and add an extension, meaning two solder points. It would honestly be a nightmare and I would not recommend this approach. If I recall the G4 had a video out port. I remember people using this when their iMac's monitor died. I would recommend purchasing an external monitor and connecting it to this video out port. You could remove the entire neck or simply the monitor. If you are set on extending these wires I would recommend using either the wires from another iMac G4 neck or LVDS wires. If you go on ebay and type LVDS cable you will find many LVDS cables that came from monitors, tvs etc. Good Luck. I tried to,follow e best I could. I am getting the backlight but nothing shows but white. The OS recognizes a monitor is plugged in. Any advice? Check all your connections with a multimeter, something is not hooked up. Are you using the right neck, did you use the dvi connector? please add more tutorials for example how to make 2 half ATX power adaptor for imac g4 from one orginal ATX please consider this request! i mean buy some atx PC power adaptor but change him in two half exactly the same idea as orginal adaptor in imac g4 to fit the inside faraday cage . This would be very difficult. After some time with the original PSU - it seems it's able to be so small and simple because it relies on the motherboard for most of its voltage conversions. Fitting an tax PSU into this footprint would be difficult. OK I'll bite: the black G4 shown in the photo appears to have the final version of the GUI from a first generation Apple TV displayed. How did you do that? If you have worked out a way to make the first gen Apple TV menu display on a Mac you will be very popular. (If, however, you have squeezed the Apple TV hardware into the base you will be less popular but nevertheless thoroughly respected). Good eye! The answer is gonna disappoint you though. There is no computer or Apple TV in the base, this is simply an external monitor, it is Mod #1. In fact all 3 of this are external monitors only. I thought the picture would look better if the monitors were displaying something. So, I hooked them up to what I had available. 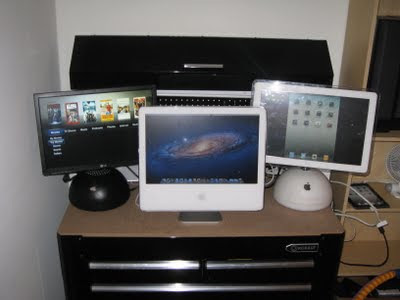 The iMac G5 to a mac mini, the white iMac G4 to an iPad via HDMI adapter, and the black iMac G4 to a 1st generation apple tv that sits in the closet. So, the apple tv isn't even inside, its external (just not in frame). Sorry to confuse you. As I'm sure you know, the 1st generation apple tv was x86 based (Pentium M) so in theory a way could be found to run it natively on a PC/MAC, sounds like a fun project. I thought it might be something like that, or maybe even a VNC window. There was a project that achieved this called atv4mac hosted on google code but so far it has only been developed to version 2 not version 3 like your display shows. It appears it became too hard to reverse engineer the necessary frameworks. I just came across this blog by chance a few days ago. Awesome work! I actually put a 1st gen Apple TV in a dead iMac G4 20" some years ago. I wanted to use the G4 as a photo frame. Note that since the built-in LCD panel of the iMac doesn't support HDCP (encryption) you won't be able to play iTunes videos. Otherwise it'll work fine for photo or music streaming. The other drawback is that I didn't have enough time to find a solution so the panel would turn off when the Apple TV goes into stand-by mode. Impressive work! thanks for posting the knowledge. I am not at the level of electronics as you are but have built a G5 PPC hack which required lots of wiring (as I wanted it to look professional). I am hopefull I can follow your guide for the G4 monitor and apply it to the G5 - after that I would think its just a matter of power. and what year uses the 'usb type' isight? Im sure that its doable and there are several ways it could be done. Getting the monitor to work will not be the difficult part. The hardest thing that I see is fitting in a motherboard to make it a hackintosh. The 3rd generation iSight is remarkably slim. Obviously apple did it with an old computer and G5 processor, but they custom built the case and the motherboard to fit perfectly together, a luxury that a hackintosh wouldn't have. Even the ECX would be too thick. Of course a notebook board would work, but they are not easy to work with: tiny ribbon cables with proprietary connectors. In terms of the LCD - the 20" pinout for the G4 will probably work here and the inverter also needs a 24V source and probably works similar to the G4s inverter. Likewise, I'm sure even the native PSU can be used. I do not know what year iSight, but all the cameras seem to be the same, so I'm confident that any iMac G5 iSight will be USB compatible. What I did here was add the board and inverter from an apple cinema display. This gave me the 2 USB ports I needed to hook up the camera and microphone. Even these two thin boards were a tight squeeze in the iSight case. I had bought a cinema display with a broken screen. Since it worked with the G5 screen (almost identical models), almost no modding was needed. You could probably find the controller/inverter or a similar broken screen cinema display on ebay for a reasonable price. I placed the LCD controller and the cinema displays inverter where the original motherboard and inverter were. After wiring the iSight to USB and the microphone to 3.5mm audio (then to USB via a USB sound card). The touch controls are accessible in the bottom of the housing and the wire goes out where the original power cord left. Can you give me some more information about mod#9 please. 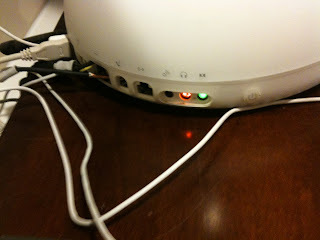 I want to mod my imac G4 but i want to know what MB you used. How did you connect the display? trough DVI? Sure, I used the intel core i3 NUC with thunderbolt. The DVI was converted to a TMDS signal that the neck wires and LCD accept. It is identical to the method used in the 20" Sandy Bridge Mod. Now i want to use my g4 as second monitor for my hackintosh, but i cant find find a site where i can buy a molex connector? Can you send me a link to the site that you use? 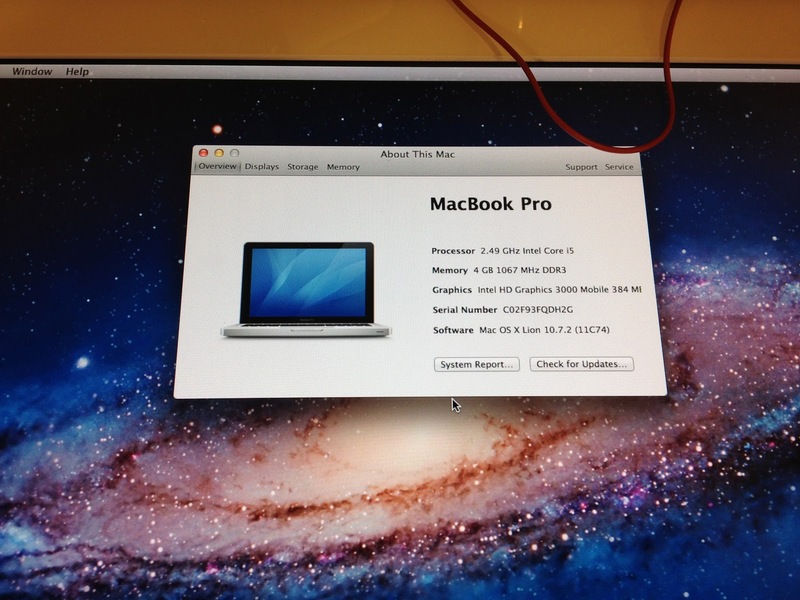 Maclifehacker112 - I've had a step by step guide for the 20" posted since November of 2011. This guide takes you completely through the wiring of the LCD to the installation of the Sandy Bridge KEEX-6100. This guide did not use the original PSU, but has been updated to include that option. Installation of a different or newer board is as simple as powering the board and hooking the HDMI cable to it. Soon after I completed the step by step for the 17" - including both models/necks. I also have a video guide for the 17" as well. Please see the top of the blog. There are tabs under the title for the guides. The 20" picture/video guide will differ from the old guide simply by connecting it to an NUC board, but nothing else is different. I bought an iMac G5 late 2006 (intel core 2 duo). I'm looking for a replacement LCD for it (vertical line problem) but i can't find any for a good price. 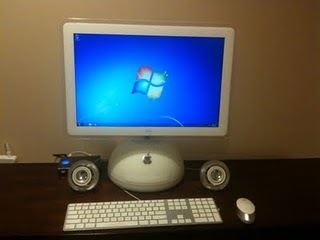 I have also bought an iMac G4 15" and i'm going to use it as external monitor. Thanks for making these awesome guides. Electronic devices are exposed to dangers producing troubles brought on by spikes in addition to surges associated with electrical currents. This specific 6 means surge & overload protection board was designed to safeguard your current devices by injury your current equipment. The item comes with a mains filtration & telephone line security. Wow what an amazing resource! I'm itching to start my own Mod now! Just curious if you could some how stick the guts of a Mac Mini into the base of an iMac G4 and get it working using the original monitor and neck still? Currently thinking about trying to turn my dead g5 20" into a secondary monitor via HDMI or VGA do you think this is possible, i seem to be finding mixed opinions / results online. Throughly impressed with your patience and skills in all your mods.